After a weekend in Chicago, I had to drop my girlfriend off in Kalamazoo for work. Before we parted ways for the afternoon, we thought it’d be nice to check out what Kalamazoo has to offer in terms of restaurants. 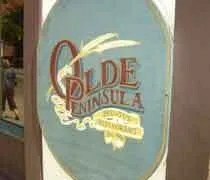 I saw a recommendation for Olde Peninsula on chow.com, so that’s what I went looking for. Olde Peninsula is located on the corner of Michigan and Portage in what used to be known as the Big Corner. 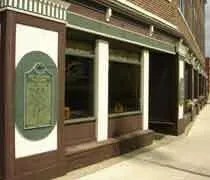 The first brew pub opened on St. Patrick’s day in 1896. The current incarnation opened after the 1980 tornado that almost destroyed the building. We walked into the building and found the hostess station near the door as an extension of the bar. The building is divided into two dining rooms. The smoking section also has the bar. The distillers are visible through a glass wall opposite the bar. The non-smoking section is divided by a wall that serves as the bar’s back wall. We were seated in a booth which was on a raised platform on this back wall. The waitress came over for drinks and we stopped her from leaving to place our order right away. While there were several options that looked good, we were both in the mood for our usual sandwiches. I went with the Olde Smokey burger. The 1/2 lb burger was topped with cheddar cheese, bacon, lettuce, tomato and a bbq sauce. The sandwich is served with a side of beer-battered fries. The sandwich was big. I had a hard time getting it in my mouth. The bacon was nice and crispy and the burger was just slightly pink which lended itself to a good flavor. I didn’t really notice the bbq sauce until the last couple bites where it had soaked into the bun. The fries were interesting. Beer-batterd fries aren’t usually my favorite, but the breading was not overpowering which made these better than normal. The front of Old Peninsula in downtown Kalamazoo. Housed in what was originally called "The Big Corner"
My girlfriend got the Buffalo Roll-Up. The chicken tenders were coated in a hot sauce then put in a tomato basil wrap with lettuce, tomato, and a blend of Mexican cheeses. After her first bite, she put the sandwich down and said “holy crap is that hot.” When she hot, she meant spicy hot. She passed a bite over to me and I agree with her. It was pretty hot. She said her lips were still on fire in the truck on the way back to work. Tomatoes aren’t usually something she gets on sandwiches and she forgot to ask for them to be left off. This time, the tomato worked to counter the heat from the chicken. The tomato was cold so it made for a good balance. We passed on dessert again even though there were a variety of options that looked delicious. Our bill was just under $20 and it didn’t take us quite an hour to eat dinner. Olde Peninsula was everything I had hoped it would be. The atmosphere was great and I wished I was in the mood for a beer. We should have at least got a growler of homemade root beer to take home, but the weekend has been so exhausting, I think both of us just wanted to get going. Olde Peninsula is definately a reccomendation I would give and a place I hope I see again. This is really awesome. I like your site and your review. Check mine out at paragonlifeblog.com.